as several men enter an unmarked police station just after the Nazi occupation of France. The detainees sit on a long bench, as if they are in a doctor’s office, waiting their turn to be examined. The tone is calm, quiet, sinister. They have no idea why they’re there. They were randomly picked up – a gypsy, a waiter, an actor, a doctor, a businessman, an aristocrat, a young boy, an old man, a painter and an electrician. These are ordinary, every day people who have stumbled down the rabbit hole into horror. The men discuss the rumours they’ve heard – of death trains, of furnaces. Should they make a run for it? Slowly, several of the detainees confess they are Jewish. Could that be the reason they were rounded up? Only the Gentile, Von Berg, played by Diego Matamoros, seems to fully comprehend what’s going on. The aristocrat tells the men he fled Austria after his Jewish, fellow orchestra members were murdered. He thinks the same thing is going to happen in France. He tries to educate the others, but they won’t listen. Only the doctor, Leduc, powerfully portrayed by Stuart Hughes, accepts their predicament and plots to escape. But Leduc’s forceful arguments fail to drum up enough support among the group to make the plot feasible. The men are stunned into passivity and disbelief. Matamoros’ Von Berg, who eloquently and passionately delivers the most poignant lines in the play, insists that the future of the world and of humanity, is in the hands of a few elite leaders, who are swaying the populace for evil or for good. He has become convinced that the tipping point has swung in favour of evil. Von Berg’s theories about the manipulation of the masses has an eerie resonance with the presidential election currently going on in the United States. His description of how Hitler mesmerized the German people, could easily be applied to Donald Trump. Miller’s ideas clearly foreshadowed what is happening today. 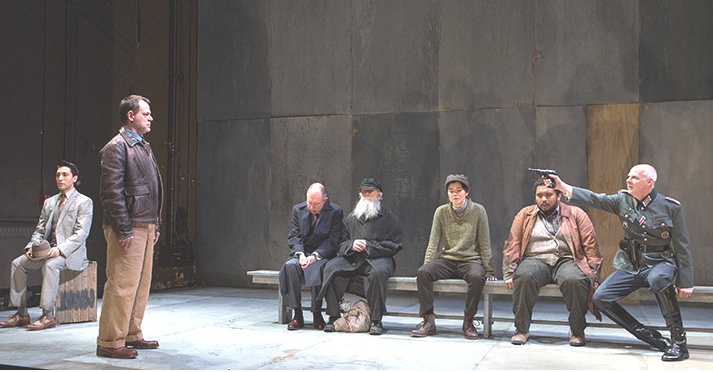 All the actors in this tour de force; one-act, full-length play are convincing and dynamic. Together they have created a masterpiece. Incident at Vichy is playing at the Young Centre for the Performing Arts in Toronto until June 23rd. Don’t miss it.